The last month has been kind of crazy. Too many long days at school. My dad is still recovering from his fall last October. But mostly, just school. All to often I come home and melt onto the couch. It's a Rikke Hat, designed by Happy Knits. You can find it here. It's actually my second one. The first was sent out as a birthday gift to my sister-in-law, Mary. Hers was green and mine is (obviously) red, but both are knit from Madelinetosh Merino DK. Unfortunately, I failed to snap a FO of her gift. Suffice it to say that I loved the pattern so much I had to make one for me. 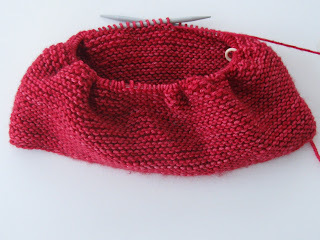 Even though it's almost spring here, I'm knitting a wool hat. Oh well. It's perfect TV knitting -- and that's been all I've been up for many nights! Sometimes it's hard to choose between form and function. Most knitted items are meant to be used, so I want to produce something useful and sturdy. But knitting is also about beauty. 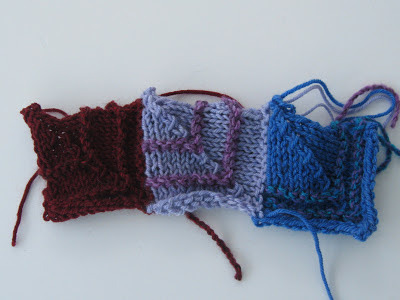 About color and texture and lovely yarn. However, in the case of socks, I'm trying something new for my go-to socks. A few people have told me that the plain stockinette socks just don't stay up as well as they should. So, I'm doing a k2-p2 pattern instead. I suspect it will be a more practical sock. But, alas, it seems a bit of a waste to use self-striping yarn (Flamingo in Shepherd Sock, Lorna's Laces), but I'm going to stick with it and see if this might be a better basic sock. While this idea is not original, I still love these hearts. I thought I might gift a few to some special people in my life. A few decades ago, Tory Hughes pioneered the methods for using polymer clay to make faux natural materials -- faux corral, faux turquoise, and faux ivory and bone -- the later of which I borrowed for these hearts. 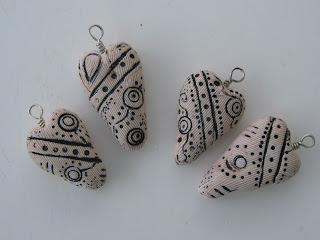 I especially like the idea of using polymer clay instead of using precious materials like corral and ivory. One thing I really love about these pendants is that they are easy to wear -- they match so many different color schemes and they are casual enough to wear every day. 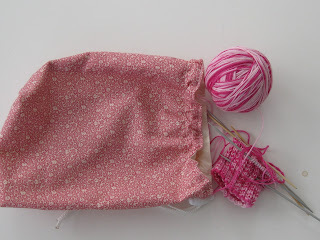 A few weeks ago, I began a sweater with great excitement. You can see it here. I was exciting about picking out the colors, that I kind of rushed into it. Now I am having huge second thoughts. I'm trying to tone it down for the body. You can see in the top photo that I'm using only one hue for each square. In my rush, I forgot about a little thing called gauge. For reasons I can't explain, it looks like the body will be OK, but the sleeves seem too small. This is what keeps me from sweaters: too risky! I wish I could spend my afternoon knitting. It's 13 degrees outside, and I'm just not up to braving the cold to go walking or skiing -- either of which would do me some good. However, I have some work to do, so I think I'll make a cup of tea and dig in. In knitting, I never have mixed feelings about using a pattern written by someone else. In fact, that is the only way I do knit. I don't feel that I understand the architecture of knitting well enough to design knitted items. 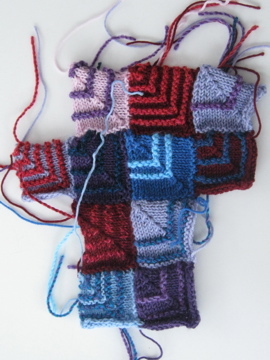 Besides, there are SO many great designs out there that I want to knit; I have no motivation to create my own. For some reason, I feel differently about jewelry. I do love making my own polymer clay beads and putting together original designs, but I also love making other people's designs. Like the one pictured: Cubism Refined, a bracelet pattern published in the December 2012 issue of Bead & Button magazine. 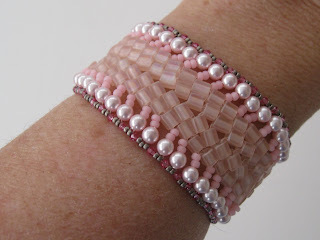 I love the way it turned out so much that I've bought materials to make a few more in different colors. I couldn't resist stocking up. The owner of my local bead store is retiring, so everything in the store is on sale! 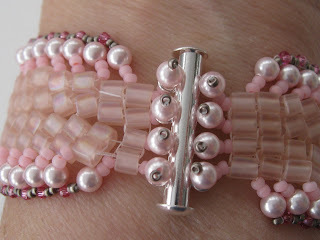 The closure is so clever: Pearls are used to secure the beads to the clasp.